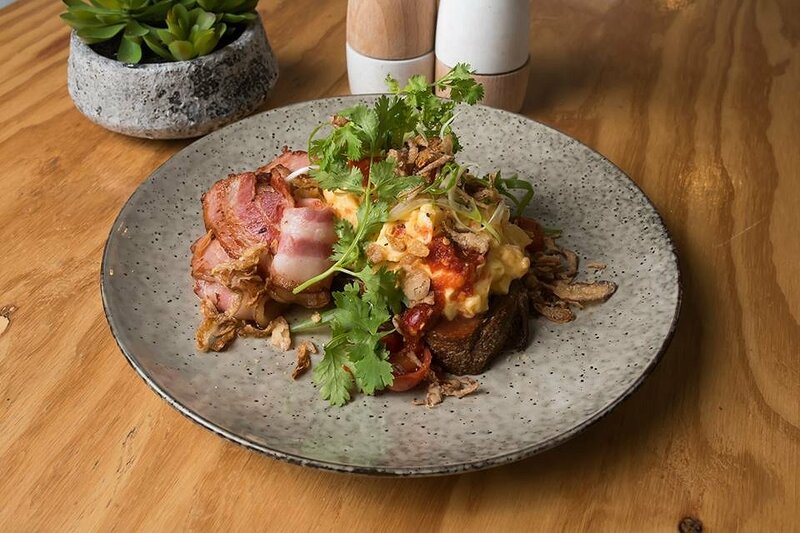 Caffiend Coffee Company, set in the beautiful town of Hahndorf in the Adelaide Hills, has recently revealed its new breakfast/lunch menu. Just over one year old, the café is already famous for its cute and rustic interior and its ever changing roasted in-house coffee beans. 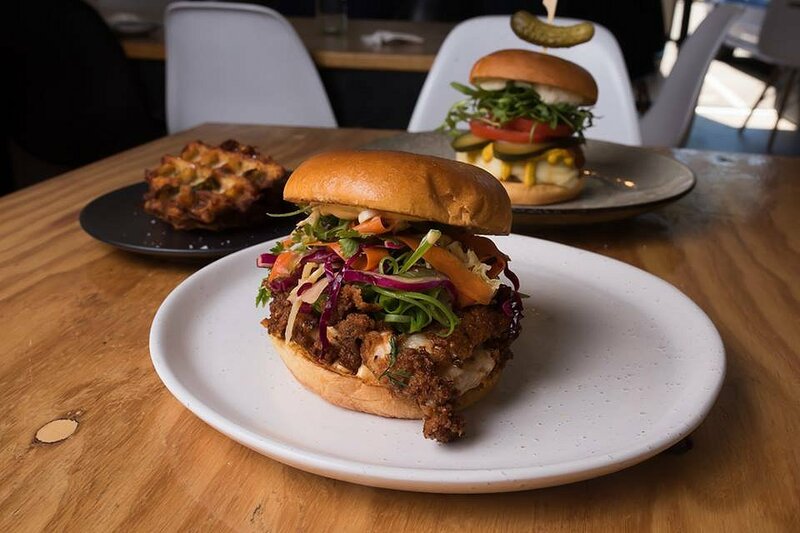 Tyson Avery, new head chef at Caffiend Coffee Company has taken over the old menu, and created beautiful dishes that have an unusual twist to keep it interesting and unique. “I wanted to turn away from the traditional café vibe and do things that are a little different in flavour, but people still feel comfortable in ordering”, he said. We were luckily enough to try nine new dishes off the wonderful menu. When the food came out, it was stunning. The presentation of each dish was Instagram worthy; all we wanted to do was take photos. The first dish that we tried was the Popcorn Chicken Waffle Cone. The house-made waffle cone was served with buttermilk fried chicken, Carolina slaw and blue cheese. This dish was beautifully unique and definitely ‘Instagram worthy’. The serving size was perfect for a main or even an entrée to share. The overall dish had a slight spice to the chicken’s seasoning but the blue cheese was a perfect paring to cool the palate. The chicken was cooked perfectly and was savoury and juicy which had a wonderful contrast to the crunch of the sweet waffle cone. This dish was already a favourite of mine and the cone was a great talking point to begin our meal. Next up was the Reubenedict. 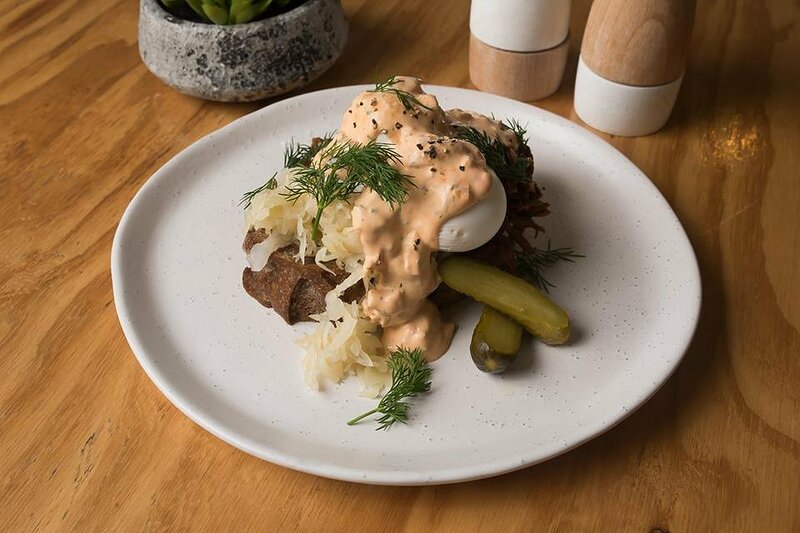 Pastrami-style beef brisket, sauerkraut, Russian hollandaise and poached eggs on rye made up this dish. Again this was a very appealing meal with a huge serving of ingredients on top of a thick slice of rye bread. The tang of both the sauerkraut and they rye was a perfect combination with the Russian style sauce. This was wonderfully creamy and smooth with a spicy hint of pepper, but it was not too overpowering that it was the only thing you could taste in the dish. The beef brisket was also wonderfully cooked and melted in your mouth. I loved the balance of it all and the eggs were poached perfectly, holding a runny yolk inside. 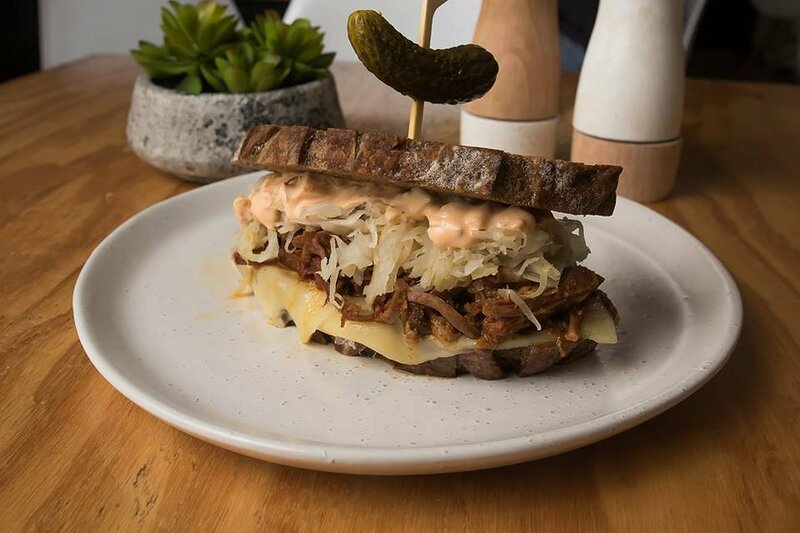 The Reuben Sandwich consisted of pulled beef brisket, Swiss cheese, sauerkraut and a Russian dressing on dark rye. The fresh sandwich was a very filling meal. The tang of the sauerkraut balanced with the warmth and slight smokiness of the beef. The meat fell apart every bite and was perfectly cooked. The Swiss cheese added a smooth texture to the meal, calming the palate of the heavier flavours coming from the sauerkraut and the dark rye. The next dish to taste was the Chilli Scramble with a side of bacon. Including sriracha scrambled eggs, confit tomato, garlic, coriander, spring onion and crispy shallots on sourdough, it was a very pretty dish. The Asian inspired meal had a hot kick of spice with each mouthful but was balanced by the smooth creaminess of the scrambled eggs. The eggs were perfectly cooked, not too hard or runny; the perfect consistency. The spiciness of the dish also contrasted well with the roasted cherry tomatoes, which added sweetness to the dish, while the added bacon brought a smoky flavour to the meal that paired perfectly with the chilli and eggs. The overall meal was graciously proportioned and would be my recommendation for any chilli lover. 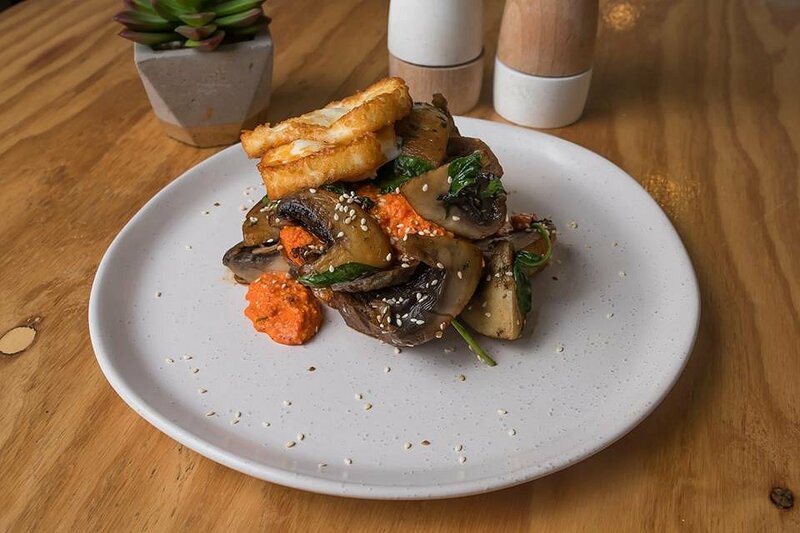 The Garlic and Thyme Mushrooms with roasted capsicum and cashew pesto on rye, with added grilled halloumi was next to taste. 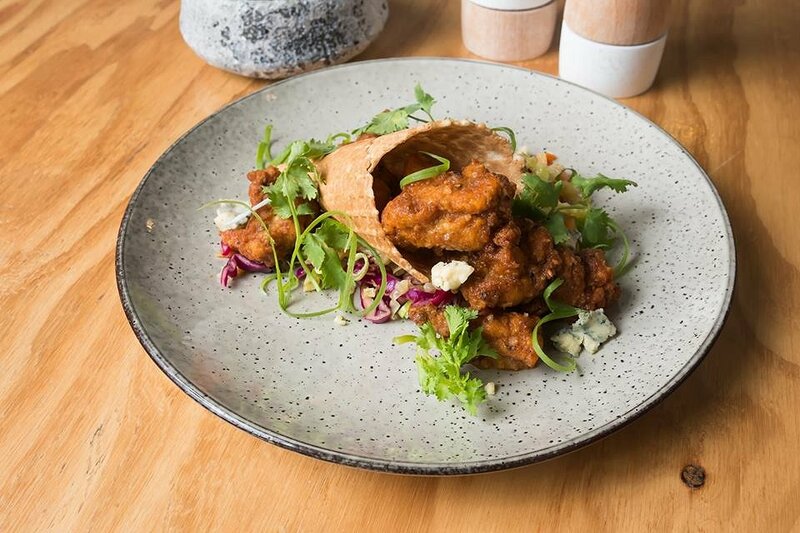 Like the Popcorn Chicken Waffle Cone dish, is a perfect size for a smaller main or an entre to share. The Halloumi was cooked well, was very fresh and was also not super salty which made you savour the cheese flavour more with each bite. The combination of this cheese with the mushrooms and roast capsicum purée was a beautiful flavour combination of spice and smoky hints from the cooked mushrooms. The smoothness of the roasted capsicum with its slight tang was delicious and left me wanting to take that home as a dip for my cheese and cracker plate. 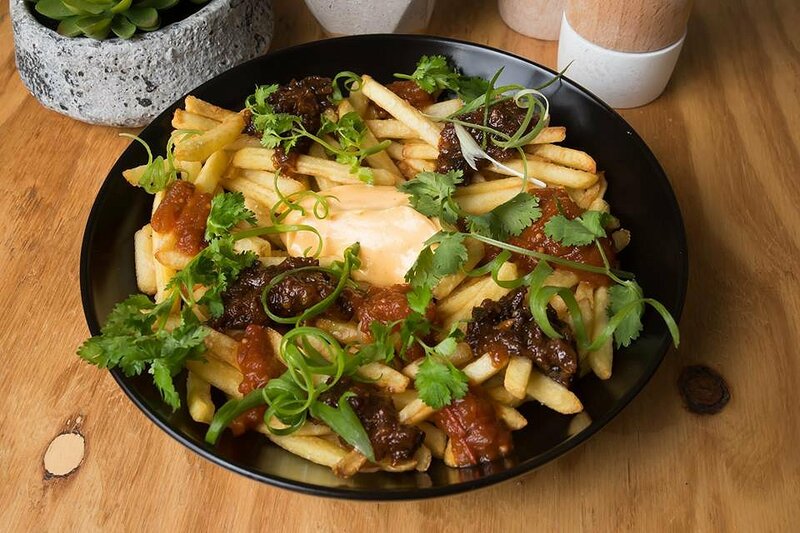 Double Down Fries was a quirky spin on your traditional café shoestring fries. Topped with bacon jam, sriracha aioli and a tomato relish, the presentation of this dish was lovely and I didn’t want to disturb the plate by tasting the complimentary sauces. The aioli was not too spicy and went well with the smooth potato inside. The tomato relish seemed freshly homemade with its pure tomato flavour, which was a fun spin on regular café ketchup. My favourite of the three toppings however had to be the bacon jam. The smokiness was the perfect compliment to the crunchy fries. Next up was the Southern Fried Chicken Burger. The large sized burger consisted of buttermilk fried chicken, Carolina slaw and sriracha aioli. The chicken was well cooked, very juicy and smooth to bite in to, with the added crunchy texture of the fried batter. The chicken itself could have been served on a plate and I would have been happy with that, but its flavours were wonderfully complimented with the slight spices added in the batter, balancing the tang of the slaw and the sweetness of the creamy aioli. We had selected for the burger to be served with an extra side of Potato Hash. 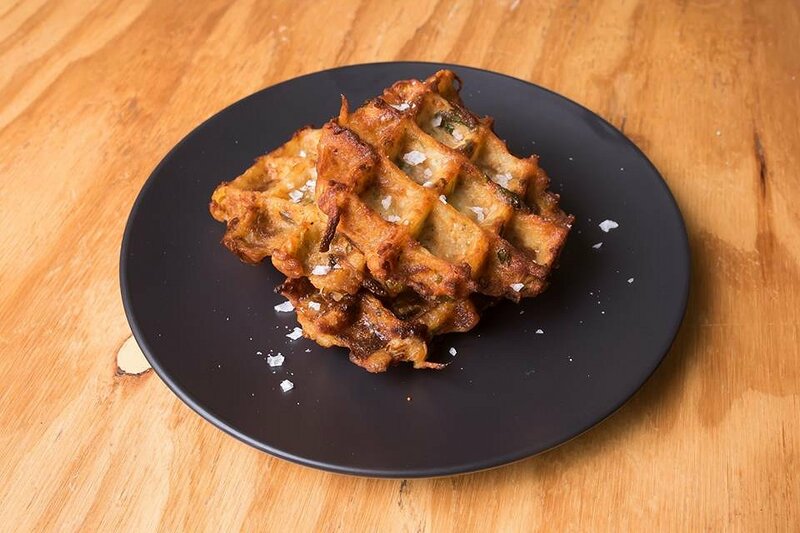 The waffle hash browns were small and light, and even though were full of potato mash, still felt healthy and fresh with the added zucchini flavour the hero of this side. It was perfect for a snack or an addition to any meal on the menu. Afterwards, we tried the Cloudy with a Chance of Cheeseburgers. Wow. If food could be photogenic, this burger would take the cake. Purely designed for Instagram this burger was almost too appealing to eat. 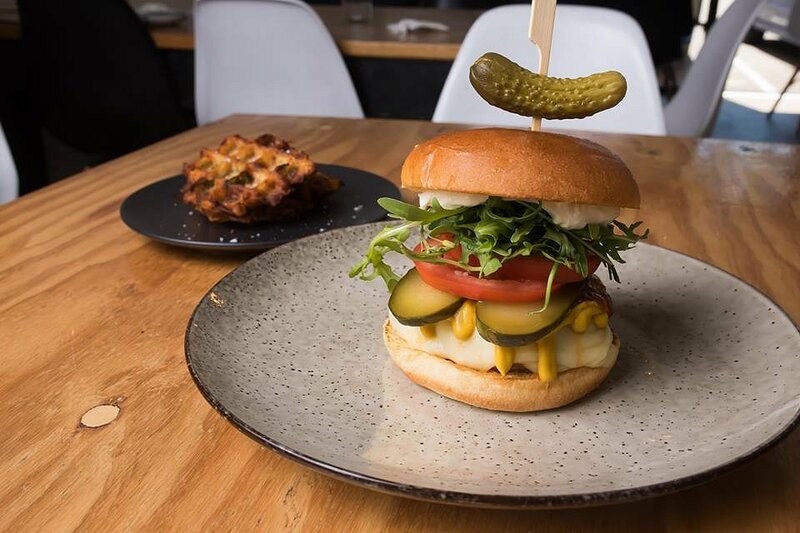 Consisting of a homemade veal and pork patty, pickles, bacon jam, American mustard, Swiss cheese, tomato relish and rocket, this meal had all the perfect elements for a classic cheeseburger with a twist. The meat patty was cooked to perfection with the perfect amount of seasoning. This was complimented with the mix of multiple sauces that pleased the palate. The tang of the mustard and the crunch of the pickles were beautifully paired with the fresh rocket salad and the juicy meat centre. All flavour combinations were perfectly complimenting one another and so this dish was definitely one of my favourite meals of the day. Our final dish to taste was the ‘Pancake of the Moment’. 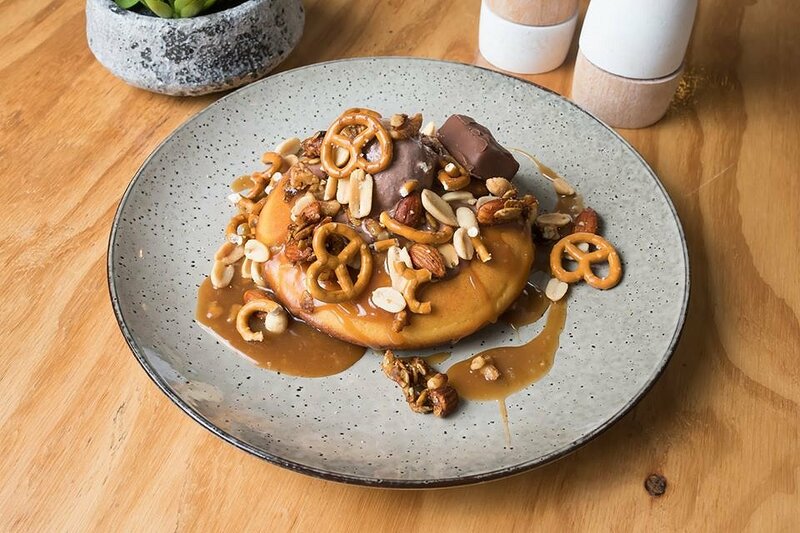 The Snickers Pancake was perfectly round and fluffy and had a beautiful presentation, topped with walnuts, peanuts, almonds, chocolate ice cream, caramel sauce, pretzels and a snickers bar. The thick ‘pancake of the moment’ always begins as a gluten-free base, using almond meal instead of flour, which gives the option to make gluten-free options to suit every customers needs. The pancake had a thicker consistency, more like that of a doughnut or a sponge cake. The pancake itself was slightly on the savoury side but was perfectly combined with the sweetness of the ice cream and caramel sauce. The textures were wonderfully balanced, with the crunch of the nuts and pretzels paired with the smoothness of the ice cream and the pancake itself. It was the perfect compliment to a snickers bar, with all the key flavours expressed in this dessert. The overall meal was delicious and I was constantly going back for more. The ‘pancake of the moment’ usually changes week to week, with Caffiend Coffee Company releasing their new lamington pancake currently to celebrate Australia Day. The new menu easily caters for vegetarian, vegan and gluten-free options, as Caffiend Coffee Company aims to accommodate any types of customers who come into their store. All nine dishes were wonderfully prepared and we could easily see the effort and planning Chef Tyson has put towards his food. We knew we were getting served great quality meals by the care that was taken to create them. Each item on the menu is prepared on site and the ingredients used are all fresh and sourced locally in Adelaide and the Adelaide Hills regions. The menu also offers plenty more options including cake, coffee and even tasting plates, ranging their choices to satisfy any customer. Caffiend Coffee Company is open to the public all week long, opening on weekdays from 8am to 4pm, on Saturdays from 8:30am to 4pm and on Sundays from 9am to 4pm. And just a few kilometres drive up the freeway, there is no excuse to miss out. So come along and taste Caffiend Coffee Company’s wonderful new menu. It is guaranteed to please.